In Napa California, Arrow&Branch Winery adds wine industry and hospitality professional to their team. Holly Horton joins Arrow&Branch as the Director of Hospitality. Holly brings prestigious industry and hospitality experience to her new role. She comes to us from her most recent experience at Continuum Estate, home to the infamous Mondavi vineyards, as Wholesale and DTC Sales consultant. 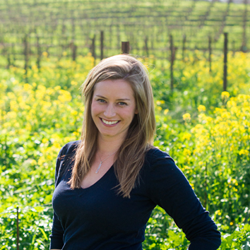 Born and raised in the East Bay, Holly received her WSET Certification (level 2) with distinction in 2016 which has expanded her passion for great wines from around the world. Since 2011, Holly has held positions of increasing responsibility with Treasury Wine Estates, Napa Valley Marriott, Auberge du Soleil, and Provenance & Hewitt Vineyards. She was originally drawn to Napa Valley seeking out connections with people through artful conversations of wine. Holly now calls Napa Valley home with her rescue pup playfully named “Zin” and believes that the recipe for a divine life is: the strong sense of community in Napa Valley, culinary works of art, and world-class viticulture realized in a glass. “I am looking forward to making a difference and using the knowledge I have acquired over the years to continue to build on Arrow&Branch's success as one of Napa Valley’s most progressive wineries that specializes in the highest possible quality wines made in small lots from very special vineyards. This is a unique brand that needs to have its story shared.” Holly Horton explains. Holly will be welcoming visitors who want to enjoy the complete Arrow&Branch experience at it's production facility, Wheeler Farms, Napa's newest state-of-the-art winery, located in St. Helena. Arrow&Branch, a boutique producer, whose estate vineyard is located in the Coombsville AVA of Napa, is renowned for its gorgeous and complex Bordeaux blend Red Wine, Cabernet Sauvignon, and vibrant Sauvignon Blanc. Winemaker Jennifer Williams, a rising star in the industry, makes wine with meticulous attention to detail and sources from carefully chosen, renowned vineyards. Some of these special vineyards include: the Beckstoffer Dr. Crane, Vine Hill Ranch, Lewelling, and Stagecoach Vineyards which allow Jennifer to create world class wines that broaden the palate. Arrow&Branch proprietors Steve and Seanne Contursi share a great love for Bordeaux wines, particularly those produced from the St. Emilion and Pomerol regions. The Contursi’s love soon grew into a passion after which they acquired their estate in 2007 from Napa Valley’s consulting legend, Tony Soter- known for his highly rated Cabernet Franc “Little Creek” which originated at this estate. Today they still maintain the organic farming practices from the estates earliest years. Through their work with renowned Viticulturists Mike Wolf, they have continually improved and expanded their wonderful vineyard. In addition to his passion for wine, Steve Contursi is also CEO, owner, and Numismatist at Rare Coin Wholesalers, America’s premiere rare coin dealership. In fact the name Arrow&Branch derives from a design commonly seen on eighteenth and nineteenth century U.S. coins. This design, found on the reverse of most United States coinage, is of an eagle holding an olive branch and arrows in its talons. The olive branch signifies the Nation’s underlying desires for peace while the arrows convey the message of battle readiness should our freedom become compromised.